For years, the spiritual lives of countless men and women all over the world have been strengthened with the help of The MacArthur Study Bible. This all-in-one spiritual library contains Dr. MacArthur’s personal study notes along with the full-length Bible text. Virtually every Scripture has a matching study note with detailed information, explanation, and helpful insight. The notes are based on Dr. MacArthur’s verse-by-verse approach to the Bible and nearly forty years of careful study. His goal is to let the Bible speak for itself—nothing more, nothing less. 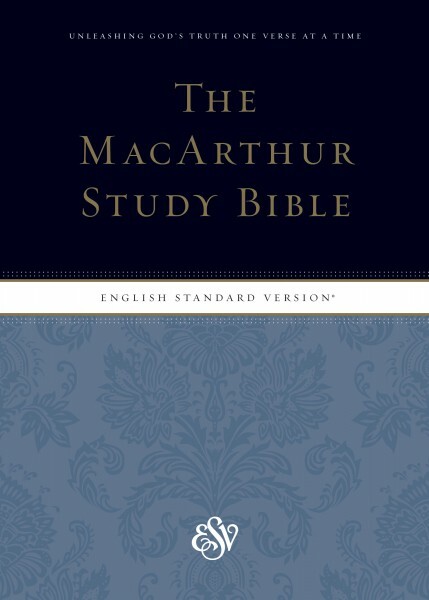 Since August 2010, The MacArthur Study Bible has been available in the English Standard Version (ESV). An “essentially literal” translation, the ESV Bible combines “word-for-word” accuracy with readability, literary excellence, and depth of meaning. More than 100 of the world’s leading Bible scholars and teachers were involved in its creation. Timeless, trustworthy, and relevant, the ESV has become the fastest-growing Bible translation and the trusted choice of millions of Bible readers, students, teachers, and preachers worldwide.